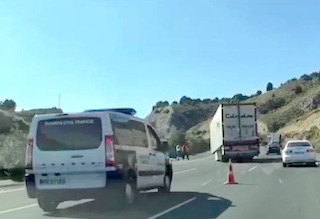 The Guardia Civil de Tráfico had to close the north-bound lanes on the A-44 between the coast and Granada, more or less opposite the Lecrín junction. The reason was because an articulated lorry had lost its trailer, after it quite literally disconnected itself from the rig. How or why this happened is not known at the moment. The result was that the front of the refrigerated trailer dug into the tarmac, coming to a rest completely blocking the north-bound, two of the three lanes. Nobody was hurt but the accident meant that a diversion was in place for about 500 metres with north-bound traffic being diverted onto the south-bound lanes resulting in single-lane traffic. Note: when the video footage was taken the diversion was still not in place – it was needed later in order to remove the obstruction (trailer). This entry was posted on Sunday, April 14th, 2019 at 7:35 am	and is filed under Lecrin Valley. You can follow any responses to this entry through the RSS 2.0 feed.